Halloween is over and most of us are probably still loaded with candy. We had a decent amount of trick or treaters, but we still ended up with leftover candy. Someday I will learn to not buy so much:) I was digging through our bowl of candy to see what was left and pulled out all of the Reese’s Peanut Butter Cups. There were enough leftover to do a little baking. 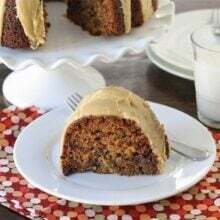 I decided to make a Peanut Butter Banana Bundt Cake with Reese’s Peanut Butter Cups. I love peanut butter and banana together. I’ve made ice cream, cookies, so why not a cake? 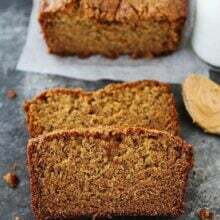 I used Dorie Greenspan’s Classic Banana Bundt Cake recipe, from Baking From My Home to Yours, as the base-I love this cake. 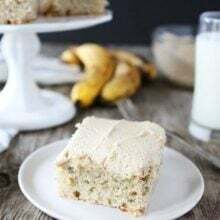 It is simple to make and a great way to use up your brown bananas. The banana flavor isn’t overpowering, which makes it perfect for playing around with. I jazzed up the banana cake by adding chopped up Reese’s Peanut Butter Cups. I also swirled in peanut butter into the cake batter before putting the cake into the oven. Our house smelled like peanut butter, bananas, and chocolate. It doesn’t get much better than that. 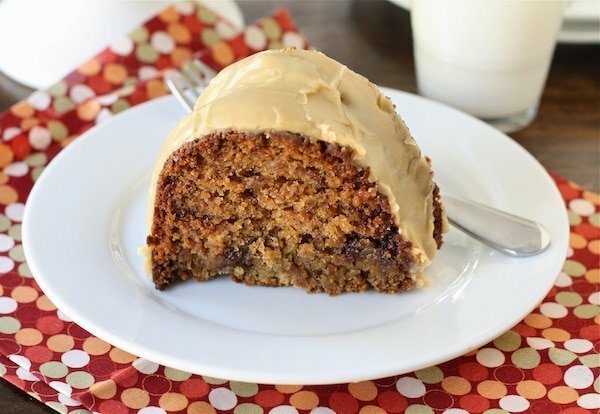 When the cake was cool, I added a thick and creamy peanut butter glaze to the top of the cake. The glaze alone is amazing. I would have been perfectly content sitting down with a bowl of the glaze and a spoon:) Don’t worry, I didn’t let the cake go to waste, I cut myself a piece and enjoyed every single bite. We’ve gotten lots of questions about what our “little pea” was for Halloween. I wanted to dress him up as a pea pod, but couldn’t find a small enough costume. So instead, he was a frog. 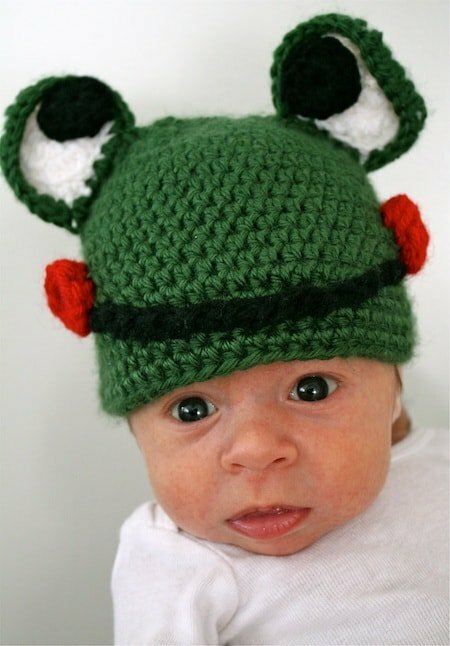 Our talented sister-in-law, Whitney, makes the cutest little beanies and sent Caleb a froggy. It was the perfect costume for his first Halloween. Thanks Whit! 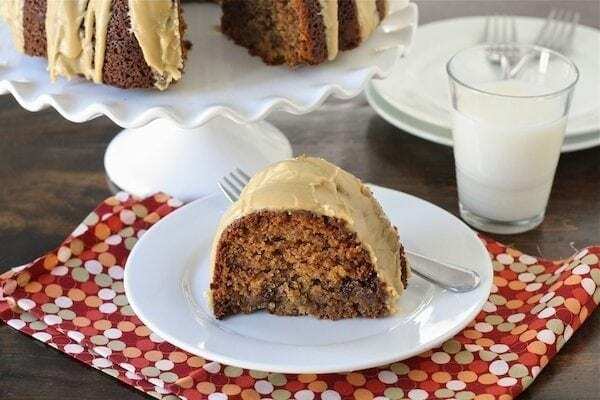 Peanut butter lovers will go crazy for this bundt cake! Preheat the oven to 350˚F. Generously butter a 9- to 10-inch (12 cup) Bundt pan and set aside. In a medium bowl, whisk the flour, baking soda and salt together. Set aside. In the bowl of a stand mixer, beat the butter until creamy. Add the sugar and beat at medium speed until pale and fluffy. Beat in the vanilla, then add the eggs one at a time, beating for about 1 minute after each egg goes in. Reduce the mixer speed to low and mix in the bananas. Finally, mix in half the dry ingredients all the sour cream and then the rest of the flour mixture. Carefully stir in Reese's peanut butter cup pieces. Scrape half of the batter into the prepared pan and smooth the top. Swirl in half of the the peanut butter, using a toothpick. Add the rest of the batter and smooth the top. Swirl in the remaining peanut butter, using a toothpick. Pound the pan on the counter so the cake batter will settle and even out. Bake the cake for 65 to 75 minutes, or until a toothpick inserted into the center of the cake comes out clean. Check the cake after about 30 minutes - if it is browning too quickly, cover it loosely with a foil tent. Transfer the cake to a rack and cool for 10 minutes before unmolding onto the rack to cool to room temperature. While the cake is cooling, make the peanut butter glaze. In a medium bowl, whisk together peanut butter, powdered sugar, milk, and vanilla extract. Whisk until smooth. When the cake is cool, drizzle glaze over the top of the cake. Cut into pieces and serve. Maria this cake looks…amazing. When I saw the IG pics of all those Reeses cups I knew you were up to something. Wow!! And he’s sooo adorable. Love the beanie. Glad you guys had a fun 1st Halloween together! That cake looks and sounds so sinful! What a gorgeous treat. Caleb looks so cute dressed as a frog – what a great costume! As for this cake, it looks delicious and decadent. What a fabulous use for leftover candy! How soon can I have a giant slice of this?? Adorable photo of Caleb! First, that beanie is adorable! That cake sounds absolutely wonderful. Banana and Peanut Butter is such a great combo and Reese’s are my absolute favorite. The glaze looks beautiful on top. This sounds sooooo dreamy!! Love this! ah what a cutie!! and this cake is make my mouth water. GAH! the costume is TOO cute…i love it! The cake sounds yummy! I love the hat.I have a new nephew and niece that those would look adorable on too. I love your creations. It looks delicious! mmmm…this looks yummy! i love the addition of pb cups! look at that sweet baby!! 🙂 he is way too cute! how do you get anything done? I would just want to snuggle with him all day! AHH! Caleb is so adorable! And the cake? W.O.W. How perfect! A great way to use up candy. And how adorable is caleb in that hat?? What color are his eyes? This cake looks so yummy! I’ve got bananas on my counter that I was trying to decide what to do with. Now I know! Do you have to use a bundt pan? I don’t have one…. I haven’t tried baking it in another pan, but I am sure a 9 by 13 pan would work! Enjoy! Holy batman. 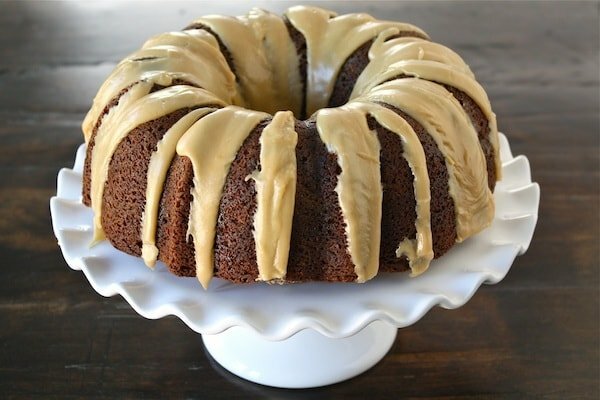 Bananas, chocolate, peanut butter all in a pretty little bundt pan. I think I just died. Seriously Maria you better save me a piece! This looks divine, Maria! I bet I have enough PB Cups from Halloween to make it happen! Great seeing the little guy, too. So precious. forget the cake, can eat caleb? This cake looks amazing!! And I definitely need to check out some of those beanies for my little guy, because yours is too cute! Oh my goodness, your little guy is the cutest! That is the cutest frog I’ve ever seen! 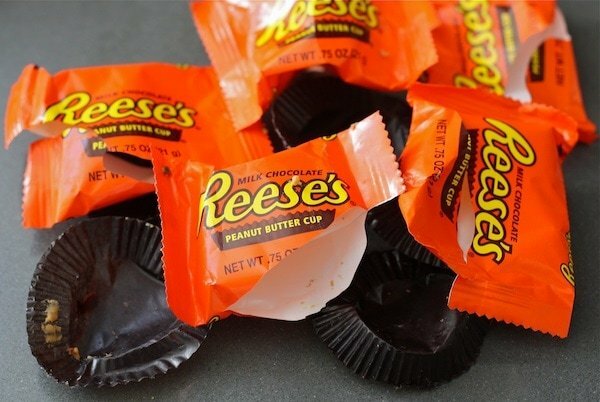 I think i would have gone with the dark reeses pb cups…those are divine. But it looks really good! For the cuteness of that lil’ froggy! And the deliciousness of that cake! Caleb is an cute frog!! I love the combo of pb & chocolate together and the glaze on this looks fabulous im definitely bookmarking, thanks for sharing! Oh he is simply precious! What a cute little frog!! This cake looks delish! I have tons of peanut butter cups left- thanks for the recipe! Beautiful cake and I love that cake stand. Oh, and my heart is melting over that precious baby boy! Awesome recipe for using up that Halloween candy. And you “little pea” looks adorable in his froggy hat. This is too amazing for me to handle not skipping work and my trip to Ohio to go back this in my kitchen right now. Darn good thing I didn’t read this post while the boys were around – otherwise I’d be heading to store RIGHT NOW to get some Reece’s Peanut Butter Cups – I definitely will have to make this for them since this is one of their favorite combo’s as well. Love the photos of the Little Pea!! Maria, you have out done yourself!! 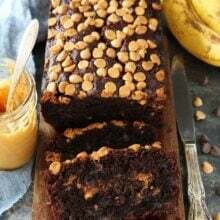 For some silly reason, it never crossed my mind to add peanut butter cups to any of my banana baking – but I MUST change that now 🙂 !! Also, little bean is such a cutie. I’m sure before you know it, you’ll have a little kitchen helper. 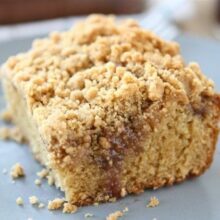 I love the banana PB combo and this cake sounds just fabulous! Reese’s were always my favorite halloween treat…I used to just eat them straight but now i’ll certainly be trying them in this cake! This cake looks fabulous! Love banana and peanut butter!! This looks so moist and delicious! PB and banana go so well together! Cake with Reese’s? Yum! Creative idea for using leftover candy. And your little guy is so adorable! Looks delish! If I wanted a more chocolaty glaze could I use Nutella instead of peanut butter? Yes! Nutella would be delicious! Oh my! This looks so good!!! I want some NOW!!!!! Now I know what to do with my left over reeses cups! Thanks!! 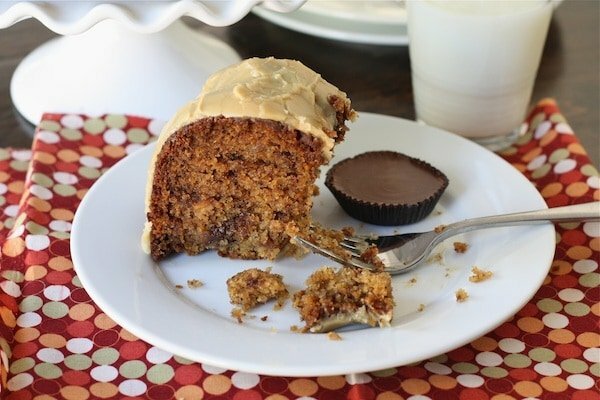 This is a great use for peanut butter cups – this cake sounds absolutely delicious! Too bad my 6 year old is hoarding his candy! Give it a few days and he will forget about it, and I can dive in and make something! Love the froggy hat – such a cutie! Oh my. I would love a slice of that cake right now – it looks wonderful! Sounds delicious — can’t wait to use the glaze on… everything? And hey, I have that polka dot fat quarter! LOVE the frog hat on your little guy 🙂 The cake is looking great too! Banana, chocolate and peanut butter is a deadly combo… I am sure it will be great. so creative!!! and delicious looking!! Peanut butter and banana is one of my all time favorite combos!! This recipe looks really good…but…I’m allergic to bananas. 🙁 I don’t suppose I could substitute something like pumpkin puree or applesauce for the bananas? I might have to experiment with that. I haven’t tried the recipe without the bananas, but I am sure you could tweak the recipe. Let me know if you try it! You did NOT! This is just brilliant. Beautiful pictures! I wish I had the things to make this cake. It looks fantastic. The Reese’s are always the first candies gone from our Halloween candy dish. your cake and baby are both yummy! This cakes looks so moist and decadent. Great job! His first Halloween! He looks so adorable! Oh goodness….this looks wonderful! Now I’ll need to raid the kids’ Halloween candy stash. 😉 Great post Maria and the little pea sure is cute as a button! I made this cake yesterday and it tasted as good as yours looks. Mine did not come out of the pan very well, but I still frosted it and it was delish! Glad you liked the cake! Thanks so much for linking up Maria!! I rushed home and made this cake…yummy! Everyone loved it. Of course, I thought I greased my bundt pan enough (or I may need a new one), but it got stuck in there. I pieced it back together and covered the damage with some glaze. My glaze did not come out as thick as your glaze looks. The cake wasn’t going anywhere but in our bellys, so looks didn’t matter. It tasted great. Glad you enjoyed the cake! Aw, your little guy is so cute! And that is one heck of a cake. Wow! What a cute hat! That glaze is mouth watering! I made this cake yesterday to rave… and I mean RAVE reviews. It was one of those shining moments that even I could not deny how fabulous a cook I am. 😉 I took one bite and fell in love. There were shouts of exclamation, moans of ecstasy and near tears from all who had some. Of course I’ve given credence to your website. Amazing… just amazing! So happy the cake got rave reviews! What a great way to use up Halloween candy! And who doesn’t love peanut butter and bananas together? Your little pea is so adorable! I made this and brought it in to work today for my co-workers birthday (I am the resident birthday baker) and everyone LOVED. I was worried since I had never made it before so I made red velvet cookies as back-up but I didn’t even need them. This was such a fabulous cake and the perfect ratio of bananas and peanut butter. My roommate can’t eat bananas so he was super bummed he could have any because he loves peanut butter and reeses. Does anyone know if there is something I can substitute the bananas for? Just made this with leftover Valentine Reeses Peanut Butter Cups. We LOVED it. I’m not sure that there will be any left after tonight with my family of five. This recipe is definitely a repeat! Thank you! Glad you enjoyed the cake!! I made this. Make sure to grease all parts of your bundt pan really, really well. Mine stuck to the inner part of the pan, so I had to piece it back together. The recipe directs you to cool the cake on a wire rack before transferring it to a serving plate, but I wouldn’t . Mine stuck to the wire rack and threatened to break apart from the bottom too. Luckily I made this for my family, because I had to serve it from the wire rack. Next time I think I’ll either incorporate the peanut butter into the batter or leave it out all together, because I didn’t like the taste of the peanut butter streaks in the finished cake. I also think that between the glaze and the candies, the cake was peanut buttery enough. My son loved it, though!